This post was meant for Saturday morning since it was Friday night’s dinner. The idea is to post a fish recipe every Wednesday and Saturday, since I try to buy fish on Tuesdays and Fridays when it is fresh in the market. Internet troubles, what can I say? I live in Rome. This is a recipe that I picked up from a trattoria in the port of Lavagna in Liguria where my in-laws live. I have been to this trattoria a number of times and I am ashamed to say that I always order the same thing. 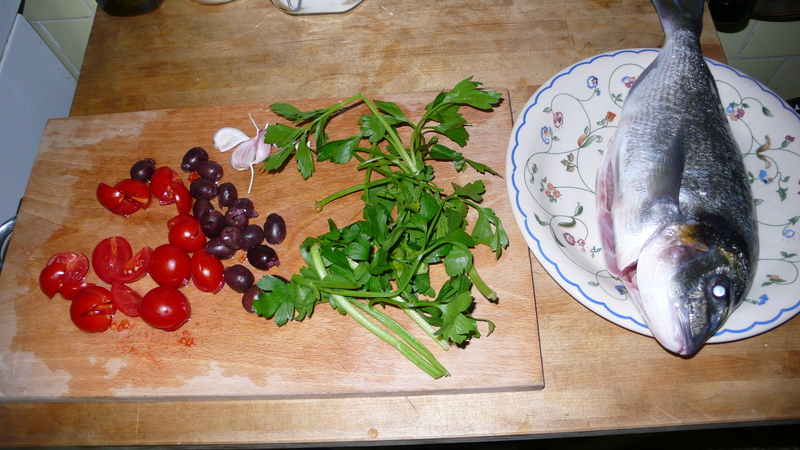 I know that the fish will be fresh and I love the way that they roast the potatoes with olives, tomatoes and pine nuts. 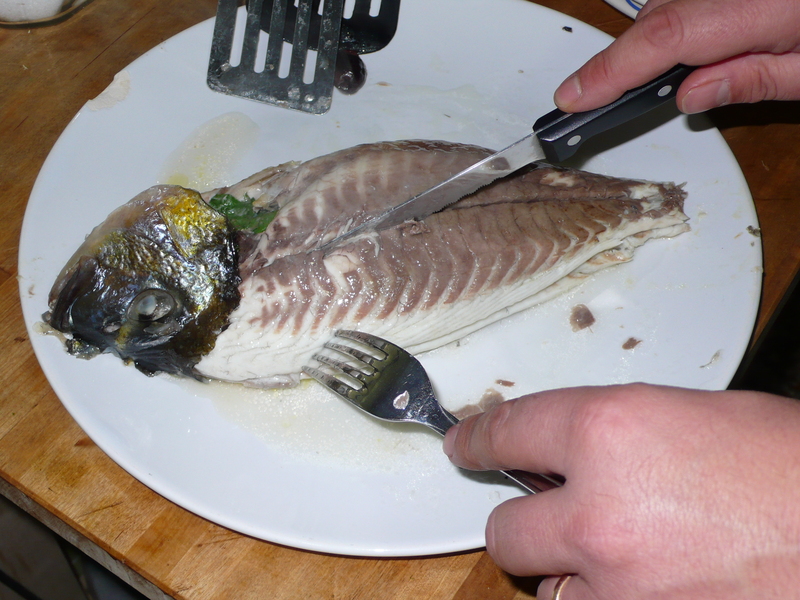 I’m surprised that this wasn’t my first post on italicious, this is one of my favorite ways to prepare whole fish and I think I may make it too often. What makes it typically from Liguria is not how the fish is prepared but the way in which the potatoes are roasted with cherry tomatoes, pine nuts and taggiasche olives, which are frequently used in Ligurian cuisine. 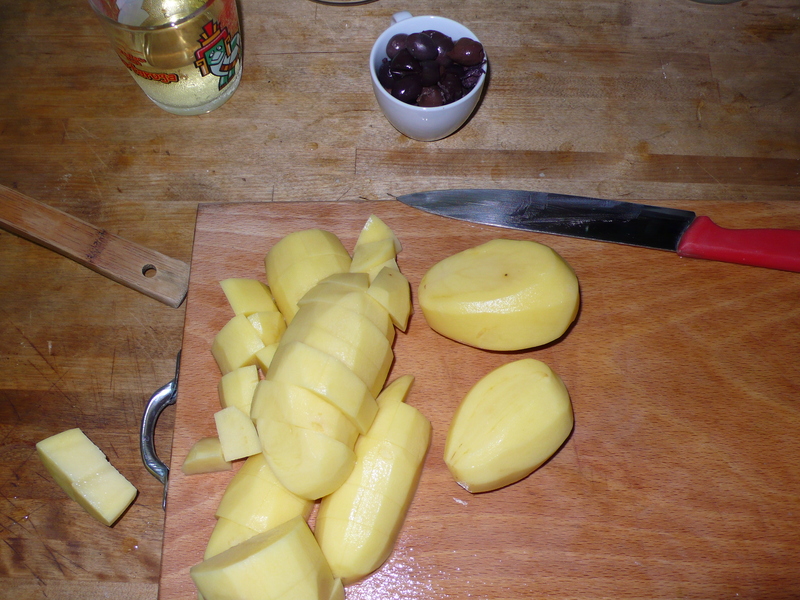 Peel potatoes, cut the potato lengthwise into 4 quarters and then cut across into 1/2 inch pieces. Cut tomatoes into quarters and toss together with potatoes, olives, pine nuts, garlic (about 6 whole cloves), olive oil and a pinch of salt. Stuff 2 cloves of garlic in the cavity of each fish along with the parsley leaves, add a pinch of salt and drizzle about a tsp of olive oil inside the cavity. Place fish in the middle of roasting pan and drizzle olive oil on top (I tend to use parchment paper to avoid the mess and to keep my roasting pan from smelling like fish). Spread the potato mix evenly around the fish and place in the middle rack of the oven for 30 to 40 minutes. About half way through the cooking time turn the potatoes so that they will brown on both sides. Bake until the meat is white and flaky and the potatoes are browned and cooked through. When I make this for a lot of people and there isn’t room on the pan for my potatoes, I will roast the potatoes in a separate pan and will put them on the bottom rack making sure to turn them more frequently so that they don’t burn. Clean the fish on a separate plate and in a separate serving bowl toss the potatoes with fresh parsley that has been chopped up. Serve immediately. ~ by italicious on October 27, 2008.
can i tell you how divine this looks? also wonderful as i can easily find all the ingredients here! thank you mama! this is dinner wed. night for us!